Majuli…the world’s largest river island, tucked away in the land of tea estates – Assam. It has been three years since my travel buddy Nikhil Kashyap and I visited this charming island. 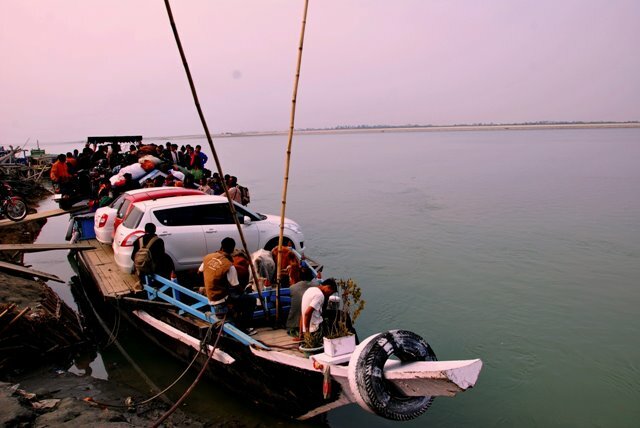 Yet each time we reminisce our road trips, the journey to Majuli gives us pleasant goose pimples. It isn’t just about being on an island, it’s about the melody that is – Majuli. Sailing on the mighty Brahmaputra perched on a ferry from Nimati ghat is humbling. The 2-hour ferry ride is so engulfing with locals aboard, and the gigantic river that gives a never-ending notion. Majuli gives you a glimpse of the diminishing tribal way of life. The island is home to mainly two tribes – Mishing and Deori. Majuli’s Chang Ghars (raised bamboo houses) are a traveler’s delight. Where else will you be welcomed with Apong (rice beer) and not be judged? Making Apong is a community hobby of sorts and locals break into a song and dance while at it. The folk songs will tug at your heart strings. During Bihu (between February – April) you can walk into any home and rest assured you will be welcomed with home-made festive delicacies. The people of this land are thrilled to have guests. They reinforce your belief in humanity. Deepu, who rents cottages on the island, was one such person we met. He kept us entertained with his non-stop chatter. Majuli island casts its spell on almost every traveler. How else can you explain uncle Mahesh visiting Majuli for over a decade. The locals may speak to you in broken Hindi, but their smiles will lure you to return to the island of peace.